Tanjung Kelayang Coast which is located approximately 27 km from the town of Tanjung Pandan, is a perfect place for exotic travel and panorama. With flour-like white sand,this coast forms a gulf of of granite rocks on the west end and makes a very beautiful panoramas. On the beach, there are clear milestones where fishermen moor their boats before going to the sea. 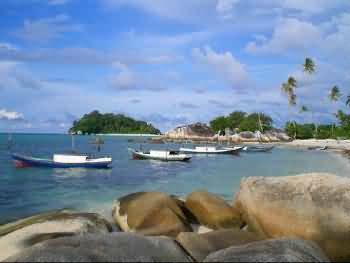 Tanjung Kelayang is a peninsula that juts toward north, with Kelayang granite island on east. Tanjung Kelayang is white sandy beaches along several kilometers. Actually, there is a strectch of white sandy beach from Tanjung Kelayang as far as approximately 4km to the Tanjung Tinggi. Tanjung Kelayang is also surrounded by small islands. These small islands creating the beautiful color blend of blue water and green islands, besides, the waves on the beach of Tanjung Kelayang is fairly calm, allowing tourists to swim there or across the surrounding small islands. Tanjung Kelayang is not only popular on domestic tourist but also foreign tourist. Moreover if there are events in Tanjung Kelayang coast like ‘Sail Indonesia‘. When some event is held there usually there are also variety of activities such as diving race, maritime festival, kite competitions, ASEAN level beach volley tournament, etc. Later in October 2011 ‘Sail Indonesia‘ will again be held at Tanjung Kelayang. 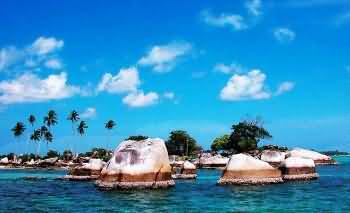 The white sand beach decorated by granite rocks is what makes Tanjung Kelayang special. The rows of small islands surrond it add up to its specialty and charm. 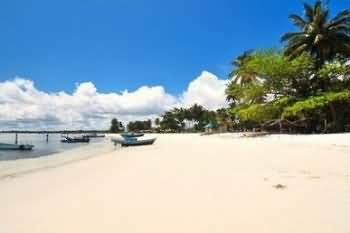 Visiting Tanjung Kelayang somewhat special, because this beach also has a panoramic view of blue sea, swaying palm trees, low tides, and gentle tropical breeze. You will definitely feel comfortable when vacationing in this place. Moreover, since the waves are calm and the water is clear and clean,it’s possible for the tourists to swim or just playing with the waves. Fishing is also one of interesting activities for tourists who visit there, because the fish in Tanjung Kelayang is also a source of income for Belitung region. 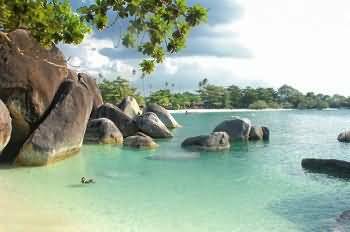 The east coast is the entrance to Tanjung Kelayang, there are only white sand here, no granite on the beach. From there visitors usually take a walk along the beach for about 300 m to the north, where the granite rocks can be found, scattered along the tip of the peninsula. One was shaped like a bird. Meanwhile, the west coast of the beach has a totally different view. The beach is not as long the east side since there are mopre granites here. The view from the west coast is the view of 3 small islands, approximately 300m from the beach. Combined with large granite rocks scattered in the sea, the scenery on the west side became more attractive, especially at sunset. The best place to enjoy the west coast is from the top of granite boulders in the tip of the peninsula. The third beautiful place to look at is from the villa, approximately 500m from the tip of the peninsula of Tanjung Kelayang. This place is like a lost paradise, even though everything is a combination of granite rocks like other places. The special thing is the unique and different scenery from other places. If you are interested to visit the small islands around the coast of Tanjung Kelayang, there are many fishing boats that can be rented. With such a close distance from the beach, traveling by boat takes only 10 minutes and you can walk around the uninhabited islands since all the islands are surrounded by white sand. Don’t forget to bring enough fresh water to drink because there is no drinking water in these islands. Contrary to the beautiful story above, you will find a resort that has not been completed and abandoned in the middle of the peninsula of Tanjung Kelayang. The project was abandoned by the owner since a few years ago. This is the main cause why Tanjung Kelayang is no longer a popular tourism object although it actually has a more beautiful panorama than Tanjung Tinggi. To get to the location of Tanjung Kelayang, you can use a motorcycle taxi driver, rent a motor, rent a car, or you can also use the services of travel to directly deliver you there. It takes about 45-90 minutes to get there. Price of admission to Tanjung Kelayang is Rp.5000 (USD $5), sometimes it’s even more expensive if you come there when there are events like festivals or holidays. With Travel Services Depending fees charged by the owner. Make sure to attend Sail Indonesia on October 2011 !